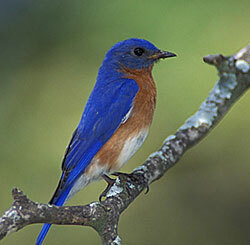 The eastern bluebird is the only one of the 3 bluebird species regularly found in Wisconsin. Bluebirds are usually found in fields, open woodlands, parks or along golf courses or other open areas, including suburban locations with open spaces and scattered tress. The eastern bluebird has a musical flight call that often reveals its presence. All three species of bluebirds nest in Montana, but the western bluebird's range is limited to the far western part of the state and its range does not overalp that of the eatern bluebird, which is limited to the very eastern part of the state. One or two broods may be produced. Watch for house sparrows trying to use the next box and immediately remove any house sparrow nesting material.